Last week was the first time I did this and it was a MAJOR HIT with the family. My husband told me he likes it when I cook and we didn’t have leftovers, even though I’d set aside two days for leftovers. Tuesday night (our first leftover night) ended up being a night when we weren’t even together for the evening meal due to various church/school events and my husband had a big lunch at work. What I learned: Make more than four servings! Hubby and The Girl supplemented their meals with cereal or something because they wanted more to eat! Not great when you’re trying to cut calories here! Last Monday, I promised I’d post a recipe for Hash Brown Beef Pie, so here it is. In a large skilet, cook beef, onion and garlic until beef is no longer pink; drain. Stir in tomatoes, chili powder, oregano, salt and pepper; bring to a boil. Reduce heat; simmer, uncovered, for 10 minutes. Stir in the vegetables. Pour into a greased 9″ pie plate (I used my regular rectangular baking dish). Combine topping ingredients; spoon evenly over the meat mixture. Bake; uncovered, at 400 deg. F for 30 minutes. Yield: 6-8 servings. 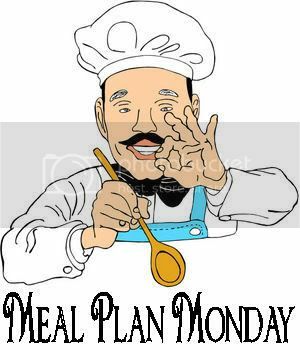 Welcome to Menu Plan Monday. I have been particpating since almost the beginning. I just decided to email my menus to my Hubby because he is often executing them. LOL! Brilliant, aren’t I? Well, I’m not sure how conscious he is of the fact that I even blog. But he does not have internet access from his desk. I scrolled down looking at your blog, God answers prayers, just not always in the way and with the timing we’d wish. I too have wished for help with Money shortages. The answer would be a reimbursement check from the Flexible benfits plan that kept the checking account from a negative balance. This was when I was really hoping for winning lottery numbers. Hang in there! It will get better. Great ideas and they all sound yummy! I know that my life is SOOOOO much easier when I have a meal plan going into the week! Even if it’s not incredible, delicious recipes that contain exotic foods and spices culled from ancient cookbooks, it makes a difference! Some weeks, I just plan that one day will be spaghetti (boil noodles and top with jar sauce of choice), one day will be hot dogs, one day we’ll call out for pizza, one day we’re eating at the synagogue potluck dinner, etc…. it really has a relaxing effect on my week because I do all my “worrying” at once rather than in front of the fridge after work each night! Keep up the good work! I am glad it worked well for you. I know since I have been participating, it has helped out tremendously! Your menu this week looks so good! I haven’t had a chance to read through your blog yet, but I look forward to doing it. But I wanted to let you know that when I menu plan, the whole family likes it….and sometimes my two little girls (6 and 9) will go in in the afternoon and start the salad or something and surprise me 🙂 But they have to know what we are having in order to do that 🙂 Another benefit that I have found from menu planning is the money saving…..I make a list, and stick to it(mostly) and don’t amble mindlessly through the grocery store picking up whatever looks good (that quite often gets left sitting on the pantry shelves for a long time). I LOVE taste of home magazine! One of my favs! your recipes sound yummy. I need to get into meal planning, it is the one thing I’ve never been able to accomplish!